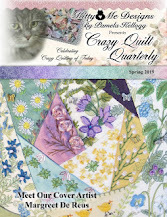 I spent much of January working on the 'Courtship' crazy quilt series which ultimately became a large-ish wall hanging. January I also shared a number of seam treatments with you. Much of February was taken up with continuing with the 'Courtship' series and I shared a fair number of seam treatments as shown above. In March I continued with the 'Courtship' series and shared more seam treatments. I also took time to make a crocheted baby gift. In April I had fun making a whole series of felt foods for our #1 grandson and also carried on with the 'Courtship' series. In May there were two finishes....the 'Courtship' wall hanging was completed and I finished the bulky knit sweater I was working on. In June there were a couple of finishes - a stained glass effect crazy quilt and I was working on making several baby clothing props for our son and daughter-in-love's photography business (miamusa.ca). In July I completed my first barn themed fabric landscape - a reproduction of the family barn belonging to my d-i-l's parents. In August I went on doll making kick and created four of these that were gifted to my friends to give to their granddaughters. September was obviously a good month for creating! I completed my second barn project, made myself a new carrying case for my circular knitting needles and made a new window valance for my sewing room. October the making of Christmas gifts was in full swing and one of the things I made was this wee yo-yo dog for our #2 grandson. November was more Christmas creating....lots of knitting and a fun fleece owl pillow. December saw some more knitting completed for Christmas gifts, and a first foray into making our own melt & pour soap. It also was the beginning of Barn # 3. NOTE: I've made all these pictures small, but if you'd like a better look you should be able to click on them and they will enlarge. If you want further information on any of them, just click on the month in my sidebar and scroll through my posts. - The San Francisco School of Needlework and Design (SNAD) has announced their latest challenge..."The View From My Window'. You can find further details HERE. 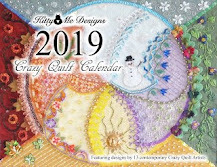 - Jenny of 'Elefantz' has just announced her latest BOM embroidery/quilt pattern series for 2018. You can find further information HERE. - Sharon Boggon is beginning the latest series of her TAST (Take A Stitch Tuesday) and you can find out more by visiting her post HERE. I guarantee you will learn a lot of great embroidery stitches if you play along with this one! Today your quote is from Carl Bard..."Although no one can go back and make a brand new start, anyone can start from now and make a brand new ending"
Happy New Year Mary Ann! I did enjoy review your year's artwork. I too this past year created some new work - angel dolls and totally loved that. I think my pics for this year are you beautiful fabric art barn pieces. They are just fantastic. Thank you so much for your loyal visits and comments you have left during the year! Look forward to seeing more lovely works from your hands again during 2018! You must be very pleased with your wonderful output and variety of work for the year. There is always an element of surprise in your creations- I love to watch them grow, especially the barns. Here's to another enjoyable year of experimenting with needles and threads. Have a great 2018. So many wonderful accomplishments in 2017! I cannot wait to see what you create in 2018. Happy New Year!